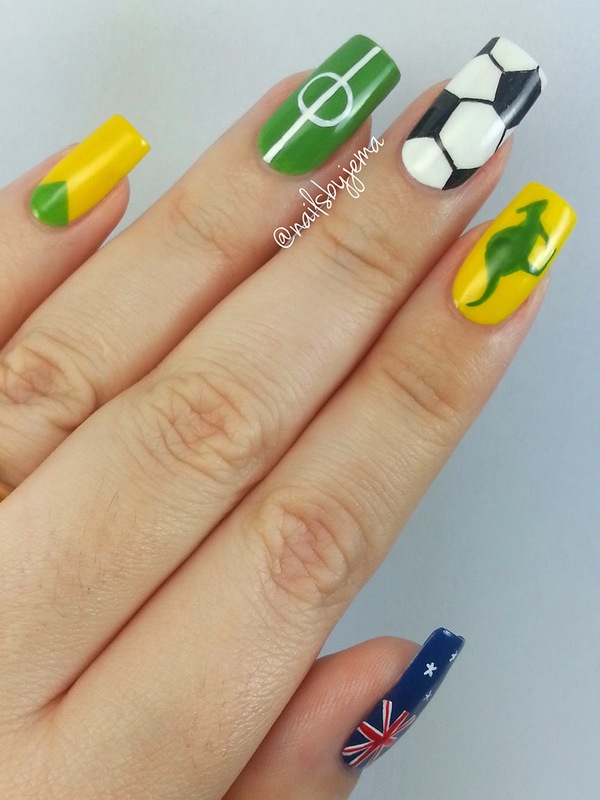 N A I L S B Y J E M A: My Australia Nails For The Soccer! Today's nails are from last night but I had a CRAZY night at the football and didn't get home till midnight, so I went straight to bed. 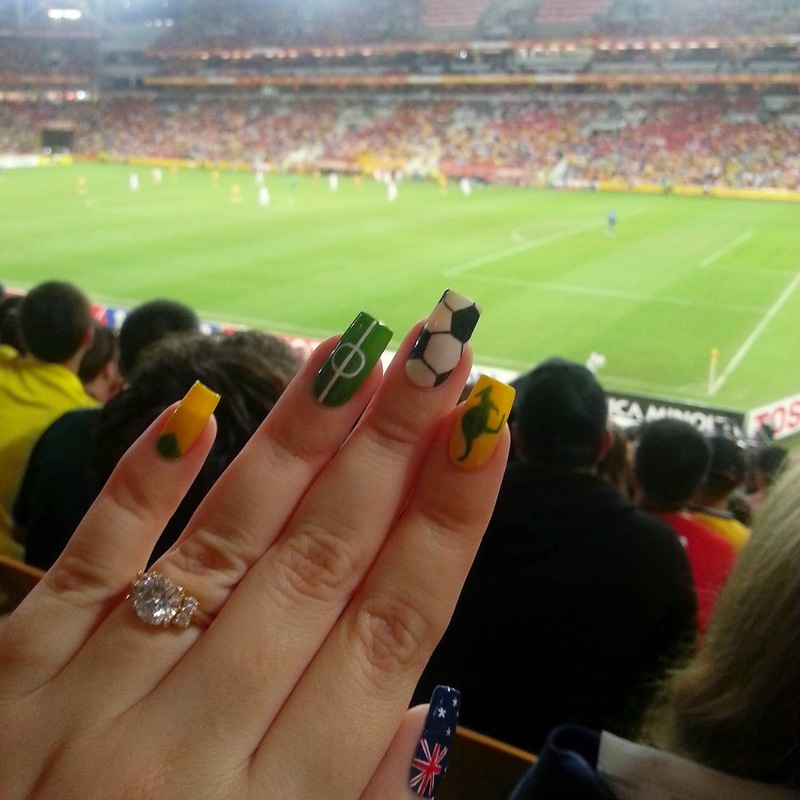 My boyfriend bought us tickets to go and watch the Asian Cup semi final last night in Brisbane. He used to play football professionally before we met and I had never seen a game in person before so I was super excited to go. It was insaaaaane!! The atmosphere in the stadium was incredible and the China fans were so high energy. A Chinese billionaire bought 5,000 tickets to the game and gave them away to Chinese supporters to help increase the numbers so the stadium was about 70% Aussie fans and 30% China fans. And the China fans had drums and were chanting the whole time. It was incredible to see their support even till the end whistle. 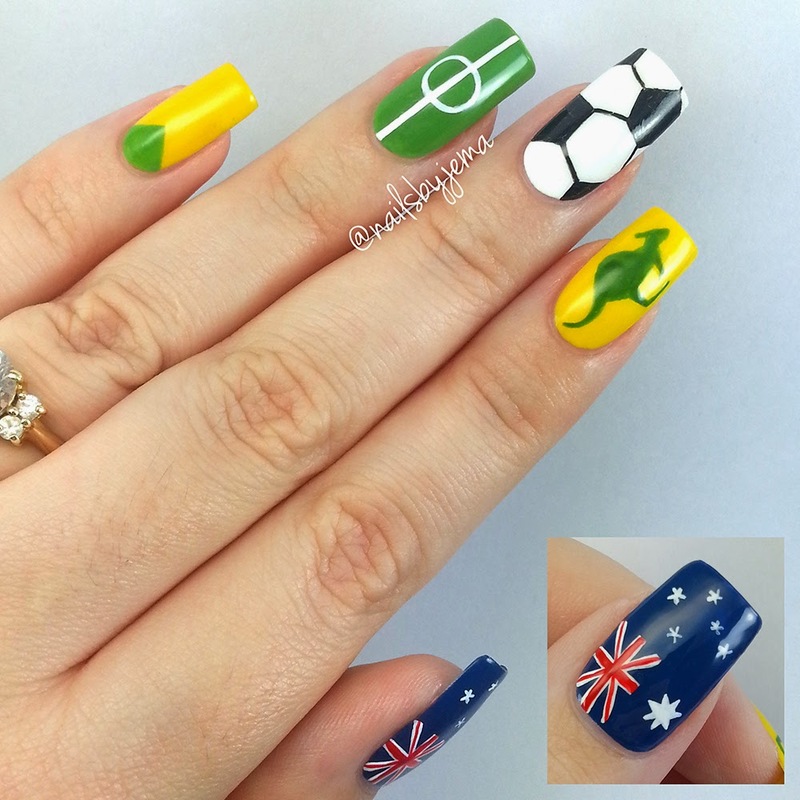 Australia ended up winning 2-0 so it was worth going! 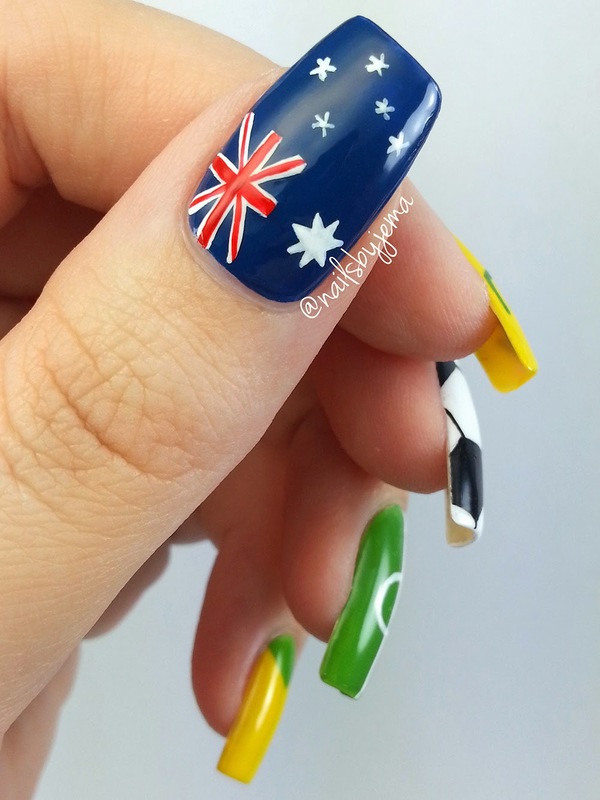 Anyway, on to my nails! These were all done with nail polish, my gel pens & nail art brushes, plus, were surprisingly easy to finish! 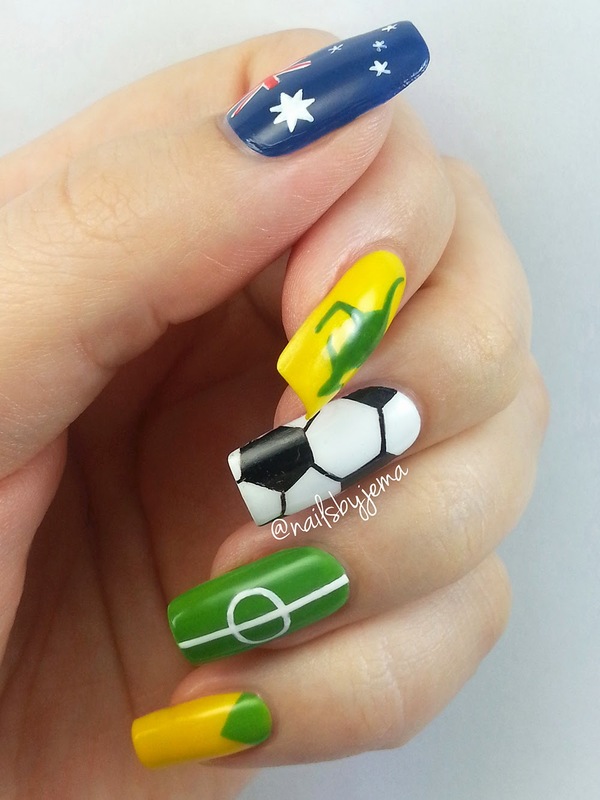 I based the nail designs on the Australian jersey, the center circle & line on the football field, the ball design, the Socceroo logo and finally our flag. The brushes I used were just cheap ones from eBay and I used my black & white Signo Uniball for the centre circle detail and all the ball detail. I used Seche Vite to top coat because I couldn't find my Glisten & Glow HK Girl top coat anywhere and it shrunk my thumb polish. It reminded me why I NEVER use that top coat anymore. I also took a selfie before I left because I was LOVING my makeup and it was scheduled to rain and I didn't want to wait for it to get ruined. I thought I'd post it here because everyone who wears lipstick needs these lipsticks. I thought since I was going to the game I didn't want to be reapplying makeup all night so I wore one of my Rimmel Provocalips 16 Hour Lip Colours. 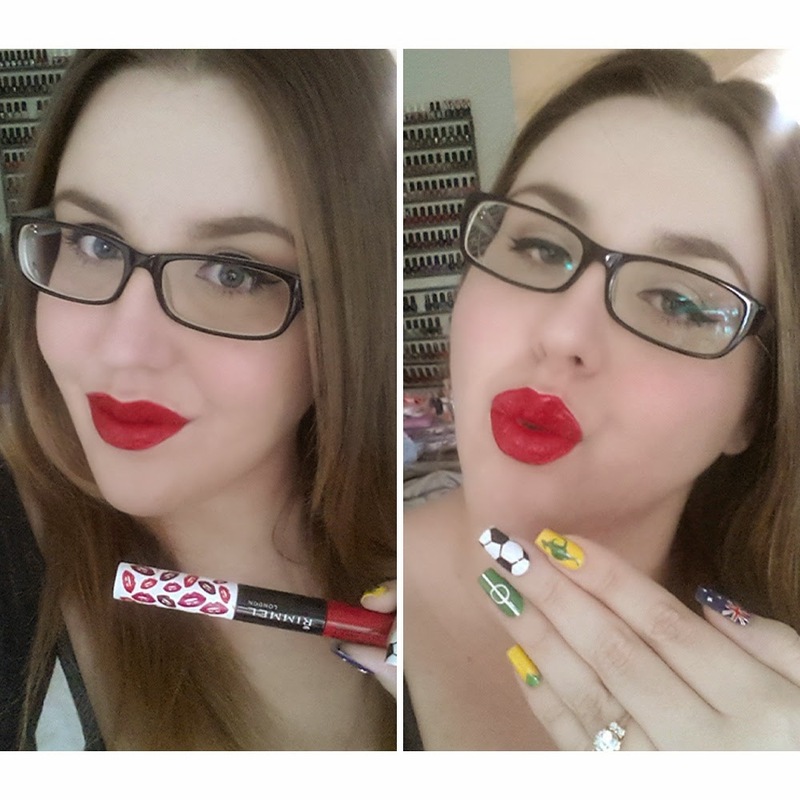 This is the shade 'Kiss Me You Fool' and the first red lipstick I have ever worn! I could never find a shade of red that flattered my skin tone and lip shape but this is it. I hope your weekend is great! We have a long weekend here for Australia Day but my area is flooding due to so much rain, so we won't be having barbeques and beach days unfortunately!